Doro PDF Writer remains one of the most efficient solutions on the market for seamlessly putting together PDF documents from any files and, thanks to its overall simplicity, it is well suited for all users out there. 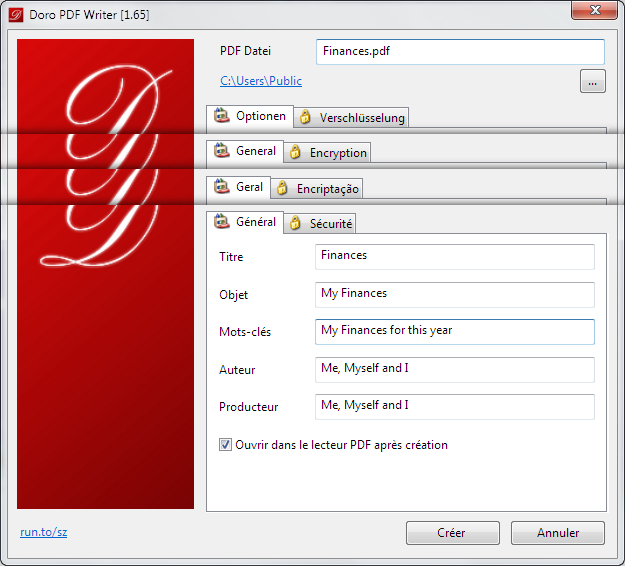 Doro PDF Writer allows you to edit the information of the future PDF file from a clean and single window, with special fields for title, subject, keywords, author and producer. Doro PDF Writer lets you create a colored PDF file from any windows program. The Setup contains all what you need for creating pdf files. After installation you have an additional printer called 'Doro PDF Writer'. Creating a PDF is no longer a difficult task, not with so many advanced software solutions on the market that promise to lend a hand in this regard. That's also the purpose of Doro PDF Writer, a very simple application that really manages to impress when it comes to making the whole PDF creating job a lot easier. The way in which Doro PDF Writer works is quite swift as it builds the file quickly and easily, even when having to deal with large documents that comprise several photos. Furthermore, it retains the layout and formatting of the original file, a feature that's pretty hard to find in today's PDF creators. The setup contains all what you need for creating pdf files. After installation you have an additional printer called 'Doro PDF Writer'. So you can create a colored PDF file from any windows program for free. No banners nor any annoying restrictions! * Write your document, also colored pictures can be included. * Select on the print dialog the printer labeled 'Doro PDF Writer' and press 'OK'. * On the Doro window which appears after that, you can specify some additional options. * Now you have a colored pdf file. You can encrypt the pdf with 128-bit password protection. Further 'copy and paste' and printing can be prevented.